History: I’ve been a fan of the Fast and Furious movies ever since the first one premiered ten years ago. The Fast and the Furious was a gritty street racing film about an undercover cop, Brian O’Conner (Paul Walker), who infiltrates the racing crew of Dominic Toretto (Vin Diesel) in an effort to bust a ring of 18-wheeler hijackers. The first film, on the surface, was no different than any other “undercover cop” movie. The underground street racing scene hadn’t really been featured before, and Fast and the Furious showed it in all its gleaming fiberglass and NOS enhanced glory. While the plot was simple and straightforward, the characters jumped off the screen. Diesel’s Toretto was the meathead jock, but he was also the tortured family man. Walker’s O’Conner was the conflicted cop, but he was also the man looking for a reason to fight. Both were antiheroes for different reasons and both grew through the quarter-mile drag races and incidental violence between street gangs. Fast and the Furious was a summer blockbuster with a bit of over-the-top action, but it also had soul. The success of the first film was followed by a sequel, 2 Fast 2 Furious, which showcased the return of Paul Walker but not Vin Diesel. This movie tried hard to duplicate the first film, exhibiting fast slick cars, street racing, and underworld glitter, but it tried too hard. Without Diesel around to inject hard hitting emotion, the film floundered with more of a buddy cop/Miami Vice feel and didn’t grow the story or the characters. For all its NOS powered flash, it felt like an extended race scene that was deleted from the first film. Despite the relative failure of the second film, the franchise continued with Fast and the Furious: Tokyo Drift which centred around a completely new cast and the new country of Japan. Dom Toretto cameos at the end, claiming to be a friend of one of the film’s protagonists, a car criminal named Han (Sung Kang) who is hiding out in his version of Mexico. Tokyo Drift‘s story was one of a son’s reunion with his father, and was a coming of age tale, and while it heavily featured underground street racing, it returned to the first film’s success of story powering the cars, albeit in drift races instead of the franchise’s traditional drag races. The fourth film, which premiered in 2009, returned to both the original cast and setting. Fast & Furious also moved backwards in time from Tokyo Drift, showing Han at work in Dominic’s crew, while O’Conner worked in a special task force at the FBI that specialized in fighting crime centered around street racing. This story had cars and story in spades. Dominic was forced to confront the consequences of his crimes, which included the death of his girlfriend. At the same time, O’Conner’s struggles focused on which side of the law he really belonged. Both characters took separate, but parallel, paths to the same truth: that together they are stronger. The film ended with Toretto choosing to stand trial for his crimes. When the justice system worked against him, O’Conner broke him out of prison. By the end of the action, the two characters had moved through each other’s worlds and into a new synthesis. Again, the growth of the characters and the story made this film more about people than engines, and was the strongest outing yet for the series. Hype: Honestly, I wondered how the franchise could stay fresh. Before going to the theater to see Fast 5, I watched the previous films (except Tokyo Drift), and tried to imagine how things could advance forwards. Most long running film series tend to duplicate themselves endlessly, relying on formula and fan base for success (such as Indiana Jones and James Bond), or are a continuation of a single general storyline (such as Star Wars and Star Trek). Even from the trailer, it seemed like the writers and makers of the F&F movies were intent on taking this new sequel, and future films, in a decidedly new direction. I had read that Fast 5 was going to take the main thrust of the movies from street racing to heists. That seemed like a stretch to me, as the major crime in the previous movies was either perpetuated by an uber evil bad guy, or was undertaken by a protagonist trying to grab a little extra, usually for understandable reasons. I had a hard time seeing the car crew/family as criminals in it for the crime. Finally, while street racing isn’t exactly boring if filmed dynamically, it was, ten years removed from the original, worn out as a plot device. I was unsure of its ability to keep an audience, or even myself, interested. I was interested in strong character development and an evolution of the devices in a fast and furious car series that had proven in could do the former and was shaky in modifying the latter. But Fast 5 worked, and worked extremely well. The brief glimpses of street racing were mere homages, or internal references. There was only one drag race, and it was played for humor, not as plot advancement. Each character stayed true to himself (or herself), and thus cars were involved, but only in the way that James Bond would involve his PP7 in a science fiction film: as a convenient way to shoot aliens. The film spent most of its time off the asphalt, and in the character’s lives. The first big chase scene was a chase on foot, and completely devoid of cars. The biggest, flashiest car featured in the film spent most of its screen time either being taken apart or put back together, not being driven at insane speeds through flashy nighttime streets. The characters didn’t really drive cars, or use cars to solve their problems. They used their non-automotive skill sets instead (talking, infiltrating, cracking, monitoring, etc). The big heist felt like something out of Ocean’s 11 or Kelly’s Heroes, involving cars only because they are convenient, and not really as a showcase for the cars themselves (which separates this film from the Italian Job, where Minis drive the plot). Fast 5, of course, had fast cars and a car chase, but the film wasn’t really about cars. For the first time in ten years, it was blatantly obvious that the titular words were not descriptors for the cars, and never were: fast and furious are schemas through which to understand Dominic Toretto, Brian O’Conner, and their car enthusiastic team. Finally, Fast 5 was able to connect all the major players from four previous and mostly unconnected films in way that made Ocean’s 11’s way of bringing together a huge cast seem like an amateur effort in collaboration. Fast 5 felt more organic, more real, than the Ocean’s films ever did. The Ugly: Some of the action seemed implausible. That really is about my only complaint. View the trailer for the film and you will see Dom and Brian towing a safe through the streets of Rio de Janeiro with two Dodge Chargers. I am not sure I entirely buy that, but I allow it because, after all, Fast and the Furious is a summer action blockbuster. Despite the character growth and drama, this is not supposed to be a hyper realistic film in which everything matches the real world, so I don’t really care. Also, I suppose that if you watch the Fast and the Furious only for the car bits, and tend to hate plot and character development, then you (probably) really won’t like this film. The Personal: Over ten years and four films I had become invested in these characters. I wanted to know where they went next, and how they solved the problem of being highly wanted fugitives who themselves desperately wanted normal lives free of complications and the threat of 25 to life. I’d also connected with O’Conner, adrift in a life I wasn’t entirely comfortable with. The trust and the love shown across such an incredibly diverse group of people who accept former traitors and cops is moving, and, it must be admitted, personally challenging. Fast 5 allowed me the time and space to project into that sort of dynamic and explore it for a couple of hours. 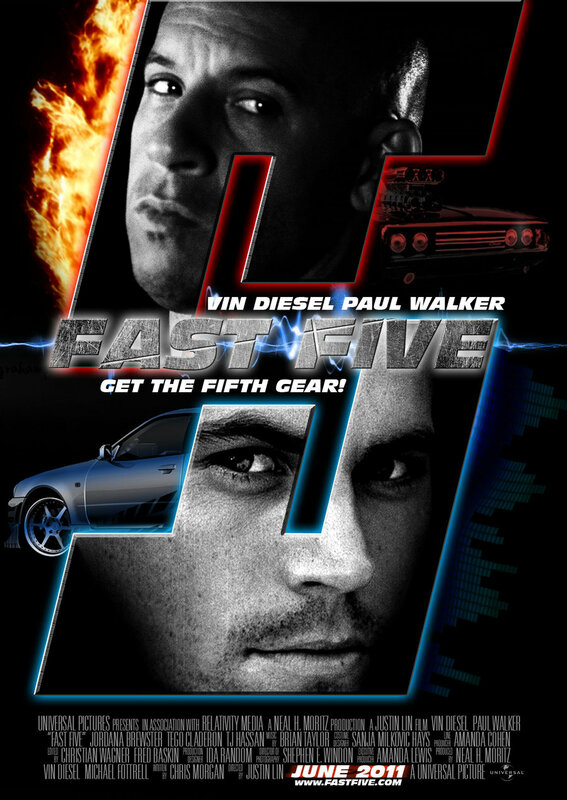 For that, I find Fast and the Furious 5 to be a great film. Final score: 4 out of 5 supercharged, NOS injected Dodge Chargers.